There is something afoot on the small car menu and for sure the Brio is not your usual decaf! 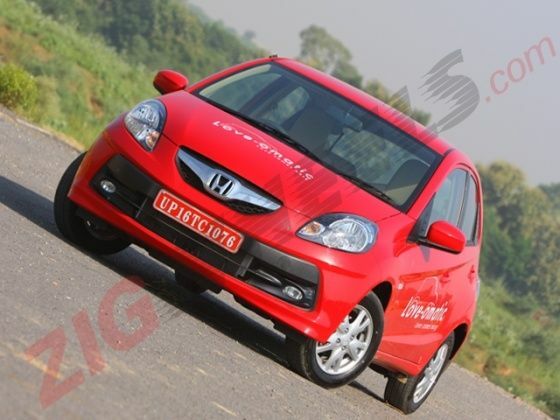 Getting into the small car segment invariably means aping the usual culprits but then that is just not Honda and that’s the reason why the Brio came into being. Of course, again, it was a major exercise for the Japanese giant which for want of the exact word, laboured to get to grips with its own demons and then some more of the market-induced kind before going low and small for emerging markets just over a year ago. It is not that Honda doesn't know how to make small cars, only that it never wanted to do that at price points which were mentally too low for its engineering prowess as also its stature in the pecking order. However to remain not just a manufacturer of renown but also hold on to its place in developing markets where its existence had been battered by illogical decisions of the pricing kind, its efforts to go low and small were decisive. The Brio, designed and built to a price, was the outcome for Thailand and India and so far in just over a year it has found space in 25,000 households in the country. Does this number make sense when the competition – read Maruti-Suzuki and Hyundai, are doing much more and also that the Brio wears the big ‘H’ logo proudly on its face? Just not Honda, or a very different type of Honda? The innovative spirit and the can-do mojo of this Japanese OEM seemed to be in short supply but recent developments within the precincts of power within the company has kick-started a new surge to get back to Soichiro Honda’s can-do ability. So while all-new hardware is already under development to be spread across the product spectrum and with that magic word ‘diesel’ already now in the Honda lexicon, what you will see from now on are small primers or appetizers to keep the juices flowing as the all out assault on the senses commences from early 2013. Till then though the charm offensive comes in small tasty love bites and the first of these is the Brio Automatic which we drove today on a sunny morning in and around the National Capital Region. Everything about the new car is the same visually as the one which debuted last year but there is new found convenience which the Brio aims to offer as yet another pleasureable attribute to reinforce the company’s tagline for the car: “it loves you back” – whatever that means! Given that the Brio is at best a city slicker operating in the tight urban environment where the cut and thrust of the daily grind is a chore, the obvious delights of the car have been further enhanced with the adoption of a five-speed automatic transmission, as an option to the five-speed manual. This is probably the first major move to a multi-cog automatic in this segment of car in the Indian market and I am sure that being proactive will do a world of good to the Honda brand which needs a hand and a leg up over its own lofty propositions. This new class leading automatic is, contrary to conventional thinking in this day and age, a torque converter-type of transmission system but one which is compact and innovative in its build. Employing a three-shaft layout along with a common driven gear for the top two speeds plus an ultra-thin torque converter, this unit is electronically linked to the 1.2-litre i-VTEC mill’s drive-by-wire system. A shift hold mechanism is in-built into the gearbox and overall the unit is well matched to the power and torque characteristics of the small 1.2-litre engine. The five-speed auto ’box has a decent performance spectrum being very flexible in its well spaced gear ratios to not only deliver zestful acceleration but also very leisurely motoring. In fact, the best bit about this new auto ’box is the easy spread of torque which the Brio can ride on with barely a caress of the throttle and to do this in peak hour Delhi road mayhem is an exemplary asset. Just riding the torque wave is enough to keep you comfortably in the engine’s ‘ECO’ mode and from there on slotting into top is where you will get the best of both worlds – peak fuel efficiency coupled to relatively less effort when at the wheel. Mind you, automatics are by their very nature power and fuel consuming and this is no different but then unlike the other archaic three-speed automatics we had seen in the past, this unit doesn’t see the fuel level indicator plummet dramatically quickly. While we will need to wait for a proper road test to determine this aspect of the Brio AT’s real world mileage delivery, taking into account the ARAI tested 16.5kmpl means that it is a pretty good performer on this count. The trouble however is that Honda being Honda, it has just tweaked the 1.2-litre i-VTEC mill with the manual gearbox to deliver even more fuel efficiency than when it started off last year. The manual transmission-ed Brio now delivers, in ARAI tests, 19.4kmpl which is almost a kilometer per litre more efficient than the Brio from just a couple of months ago! It is this aspect which makes the 16.5kmpl of the Brio automatic feel slightly wanting. Another aspect to this could also be the increase in all-up weight, the new engine-transmission pack being almost 40kg more than the manually operated version. The new automatic gearbox has massively enhanced the play and please characteristics of what was already the benchmark performer in its class of city car. Sure there is a loud harsh note when accelerating hard as the engine needs to deploy all its 88 horses to both move the car as well as get the slush box up to speed to do its bidding and there is a disconcerting tendency in the mid-range as it hunts or hesitates to shift into the optimum cog. However, it is the simple expedient of modulating the pressure on the throttle pedal which will make all the difference to the drive, be it within the city or out on the highway. Given the near-perfect driving position, the ease of controls and that great manoeuvrability, the adoption of the automatic only heightens the convenience factor of the Brio and rewards in stress-free operation. Out on the highway as well, once settled into a fine rhythm (and one can slot into that pretty quickly), the car just eats up the miles with the engine spinning in the low revs yet keeping to a brisk pace. That said, I find the move to a slushmatic slightly baffling. Honda could have gone on to a more efficient CVT unit which would also have weighed less and could have made the performance and fuel efficiency come out smelling of roses. In fact the world and its grandmother are adopting CVTs for this type and size of car so this move though very welcome makes me think and question why? Of course it is only because it is Honda that makes me question on these lines but then it can’t be faulted for upping the game in class with a five-speed automatic, so what if it is a torque-converter-based unit. Seems I have to stop this obsession for detail from all things Honda, something which the Japanese bike and car maker has done irrevocably over the years to completely spoil me as also millions of others! Nothing comes free in this world, least of all pleasure and performance and so while the operational costs would be slightly higher with the Brio AT as compared to the Brio MT, expect to shell out a bit more. Given that the Brio MT range encompasses four different trim versions starting from the base model at Rs. 4.05 lakh and on to Rs. 5.23 lakh for the top end offering (all prices, ex-showroom Delhi), expect a Rs 25,000 or so rise across the spectrum for the Brio AT. This however is a small price to pay for stress free driving especially if commuting to work is part of the daily regime. Think about the extra money as an efficiency enhancer which will pay back large returns from the very first drive! No other reason gets more compelling than this and that’s the Brio AT’s calling card.